Bush’s Pasture Park has a wide range of native and exotic tree species that do well in our USDA Zone 8 climate of cool, wet winters and hot, dry summers. The selection of trees to plant (or retain if self-sown) has never been directed by a policy or a scientific research agenda. Instead, the land’s various owners, now the City of Salem, have planted trees primarily for their aesthetic appeal. Today, the City and the Conservancy continue that tradition by installing and maintaining trees that are hardy in USDA zone 8, healthy, and contribute to the park’s aesthetics. 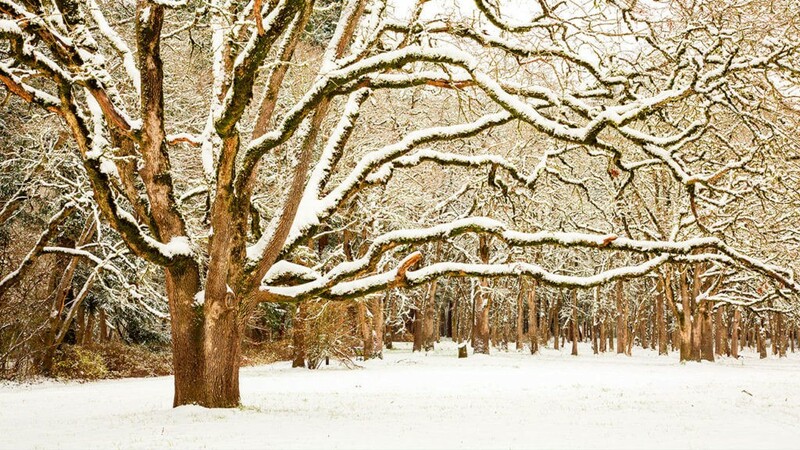 The Oregon White Oak, Quercus garryana, is an iconic tree of the Willamette Valley. Before the arrival of white settlers, the native Kalapuya tribe used fire to manage the landscape as a White Oak savannah to ensure a bountiful harvest of the camas. While many of the White Oaks of Bush’s Pasture Park are planted too closely together to qualify as a savanna, they provide visitors with a connection to the region’s past, offer a cool refuge on hot days, and serve as an important pool of genetic information for the long-term success of Quercus garryana. The City continues to plant Willamette Valley-sourced White Oaks in the park. In the future, the Conservancy plans to provide the City with a supply of young White Oaks grown from the acorns of the park’s existing oaks in order to better maintain the genetic integrity of the Bush’s Pasture Park native oaks. The Conservancy will undertake a census of the park’s White Oaks in the near future. Early in the 1930s Miss Sally Bush began hiring Elizabeth Lord and Edith Schryver (L&S) to provide her with flower arranging supplies and to improve the plantings on the Bush farmstead. Through the 1930s and 1940s L&S planted trees in the northwest corner of what is now the park. If one starts with the Kwanzan cherries west of the rose garden, the plantings surround the rose garden and house to the north and east along Mission Street, extend southward behind the Conservatory, and end in the island beds southwest of Bush Barn. 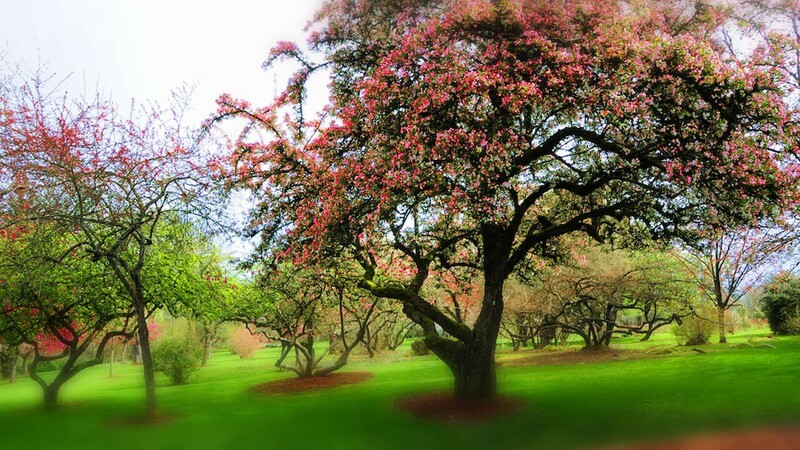 The collection included flowering cherries, 45 individual crabapples of 37 varieties, magnolias, lilacs, styrax, dogwoods, hawthorns, horse chestnuts, and many others. It is thought that L & S may have used this location as a trial garden for new varieties on the market. At the very least this glorious stand of flowering trees provided a ‘borrowed view’ from their property located on the north side of Mission Street. 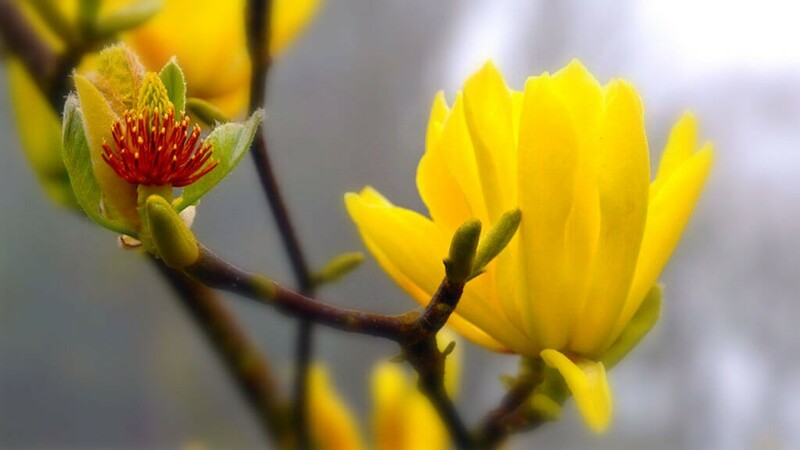 Some of these original flowering trees are nearing the end of their lifespan and need to be replaced. The Mission Street Parks Conservancy plans to take scion wood from these trees and have it grafted onto disease resistant root stock, thus ensuring the genetic integrity of the collection. The Hybrid Tea and Floribunda Rose collection is the largest of the park’s three rose collections. It was designed and planted in the late 1950s and has undergone several rehabilitations, most notably the one ending in the spring of 2019. The intention of the collection is to maintain the older roses as long as they are viable and available in the trade for replenishment. This collection is purely ornamental and is organized into color panels, an approach popular in the Victorian era. The current collection includes 98 cultivars distributed in 80 beds. This collection of Old Garden Roses is perhaps the finest collection on public property in the Pacific Northwest. Mrs. A.R. (Mae) Tartar donated their extensive collection of Old Roses to the park in 1960. 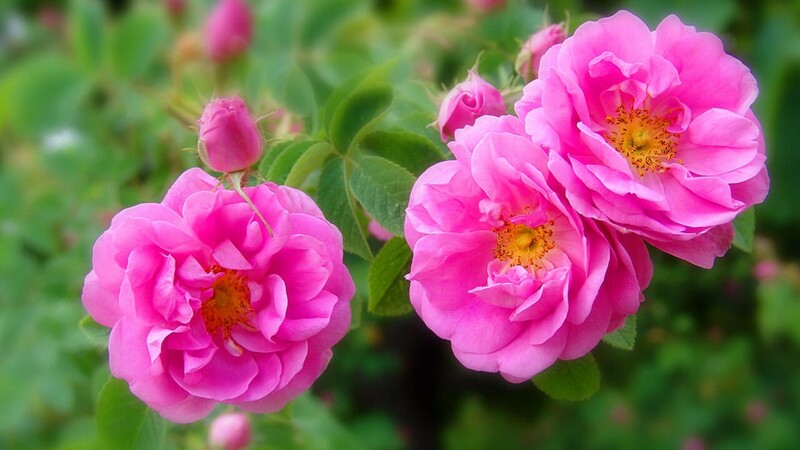 These roses were originally collected as cuttings from local homesteads and historic properties to represent roses brought from the east by early European pioneers. Along with the plants came some local, and sometimes very imaginative, common names. Through the years Portland rosarians and others traveling through the area would visit the garden. In 1979 Old Rose expert Leonie Bell studied the collection and published extensive notes in “Heritage Roses” on the identity of many of the mislabeled varieties. In 1989, with Leonie Bell’s notes in hand and additional information from Portland rose enthusiasts Jack and Janet Witter, the Bush Conservatory Gardeners (followed by the Friends of Bush Gardens) began to study the collection. Rose consultant Mark Lindsey was hired in 2006 to oversee an extensive rehabilitation of the Tartar Collection. The goal was to further identify the mislabeled varieties and to add additional Old Roses to round out the collection. The last phase of the project will include the restoration of the brickwork, including the historic central sundial feature. Original funding for this work was provided by a bequest from the Witter family. The landscape architecture firm, and next door neighbors, Lord & Schryver designed the layout of this garden, including the placement of the individual roses in each bed. 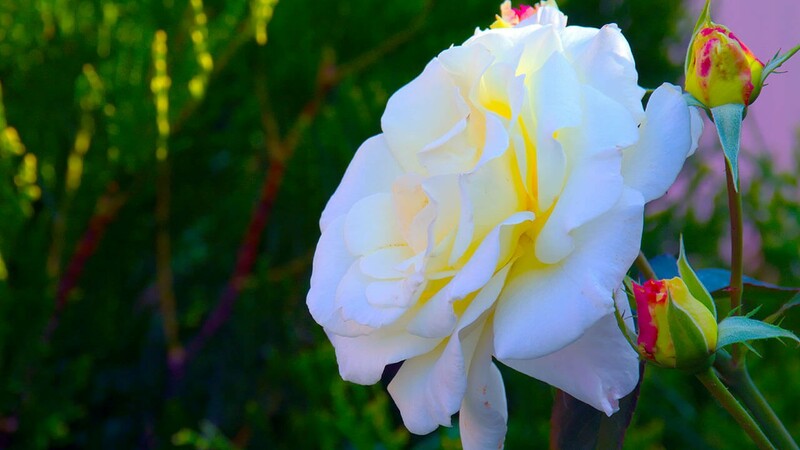 Toward the end of the installation of the Hybrid Tea and Floribunda Collection in the late 1950s, the roses growing in Miss Sally’s ‘gardens’ on the Bush farmstead were dug and divided through the graft. This provided enough plants to fill the four beds radiating outward behind the gazebo in the Rose Garden and brought all the roses in the park together for easier care. This collection includes Floribunda roses and earlier Hybrid Teas purchased in the 1930s and ‘40s by Lord & Schryver for Miss Sally, as documented in L&S billing records. Through the years these roses have been lovingly cared for by volunteers, including the propagation of the original roses in order to fill gaps in the plantings. Similar to the General Tree Collection, the park has a wide range of native and exotic shrub species that do well in our USDA Zone 8 climate. Broadleaf evergreen shrubs, which are a prominent feature of Northwest landscaping, have a significant presence in the park. 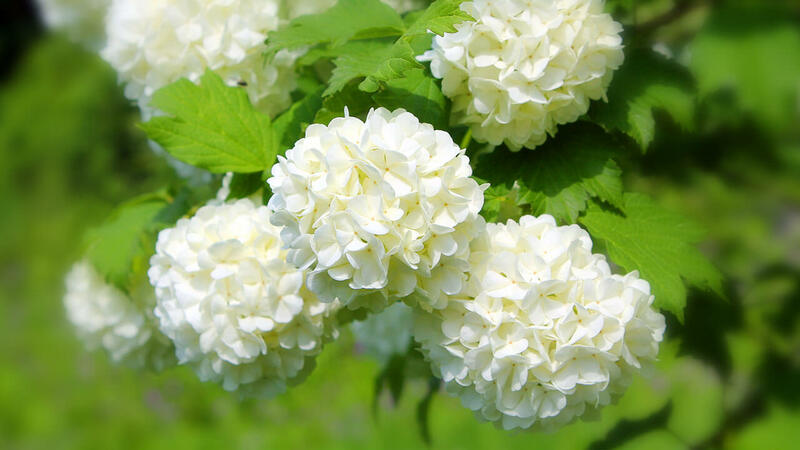 The City and Conservancy continue the practice of selecting and installing shrubs that have ornamental value, are healthy, and are appropriate for our climate. In recent years, we have placed a greater effort on showcasing native plants for park visitors. In the mid-1960s Oregon hybridizer Jock Brydon donated a large collection of deciduous azaleas to the city. The collection was planted on both sides of the park’s main path to the south of Bush Barn. Lord and Schryver designed several into their plan for the Bush Barn Foundation Plantings in 1965. 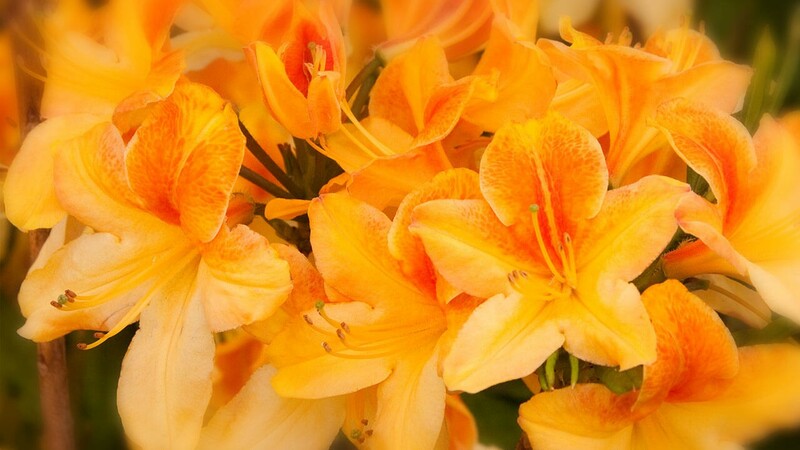 These deciduous azaleas bloom in vibrant colors ranging from bright orange to pale yellow, usually around Mother’s Day. The Mission Street Parks conservancy plans to fill-in and enhance this collection as part of the project for The Ravine, the small drainage area just south of the main plantings of these azaleas. Bush’s Pasture Park is home to a range of Willamette Valley native trees, shrubs, and flowering perennials (wildflowers), the most significant of which include two groves of Oregon white Oaks, a large field of camas (Camassia quamash) intermixed with other native wildflowers, and a Wildflower Slope that is awash with blossoms from early April through most of May. Our native plants are repopulating the park thanks in part to changes in the park’s maintenance procedures. 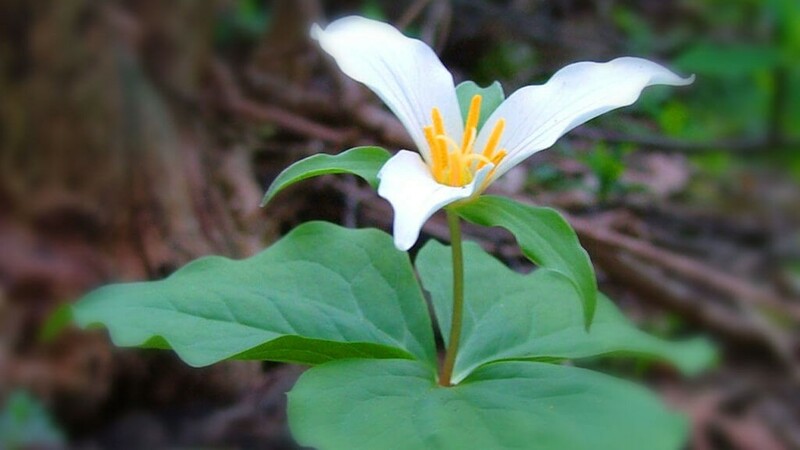 The native plant collection provides seeds for important restoration and conservation work in the Willamette Valley and is also the subject of scientific research by local botanists. The Conservancy, working with outside experts and organizations, plans to survey the park’s native plants for inclusion in our plant material database.